Newborns can snooze 18-20 hours in just one day; therefore, you need to ensure your child’s crib is sturdy and solid. Of course, we all want a peaceful night’s rest but it is crucial for young children and infants. If your child doesn’t get enough sleep, neither will you as its parent. You’re reading this article, so it’s very likely that you are expecting a baby. Congratulations! Before you score a cheap deal for a crib online, one that will have you regretting your purchase as it doesn’t last your baby’s infancy, we suggest you finish reading the entire article. Why? Because we’ll feature all the best crib and changing table combos that are not only the wisest investment you can make but are also ones that will make your life as a new parent a lot easier. If you don’t know what they are, crib and changer combos are pieces of furniture that offer a place for your child to sleep as well as a changing area where you can deliver your baby’s diapering needs. This type of furniture allows you to move your baby from its bed to its changer effortlessly and in one single quick swoop. A bed that can be used by a newborn even until it becomes a toddler, the Portofino 4-in-1 Convertible Crib and Changer is the furniture piece that covers all possible furniture your baby needs in one single box. It is considered as the best 4-in-1 convertible crib and changer for a lot of reasons. First off, its design matches any nursery design. Also, this multi-purpose crib comes with three mattress heights to ensure it provides several years of use for your family. The different adjustable levels will let you change how low or high your child's mattress to sit. Under the built-in changing table is a dresser that will securely keep wipes and diapers as well as all other changing items that you might need. Measuring 43'' H x 32.5'' W x 71'' L, it also boasts of non-toxic wood construction. It's certainly one that's hard to pass, most especially when it is from a trusted brand name. Although the previous convertible crib and changing table we featured is a real winner, a great alternative is the Remi 4-in-1 Convertible Crib with its great value, modern style, and simplicity. It's a four-in-one convertible that offers storage space that is more than enough for your baby's belongings. It doesn't just have an attached changer but it also comes with a crib conversion kit unlike most cribs sold in the market today. Although the mattress is sold separately, your baby's sleeping area can be moved into three different heights. When it is ready for a much bigger bed, the unit can be converted just by taking out one side so the toddler has a new daybed style bed. The crib is made to conform to high safety standards which is why it offers ample ventilation and is made of quality wood. The product measures a total of 35.94'' H x 71.77'' W x 29.53'' L.
The Abby 4-in-1 Convertible Crib and Changer by Delta has made its way to our list of the best crib and changing table combos because it offers the same features as its counterparts but it has a cheaper price tag. Its affordability may make the impression that it's an inferior furniture, but make no mistake as it is actually made of high-quality products with a tough construction. As a matter of fact, it has made thousands of parents happy and satisfied as proved by its high rating. Although it is a basic 4-in-1 convertible, it still has some class and style to it with its beautiful non-toxic gray finish. It's a crib that's a breath of fresh air with its simplicity, which is perfect for a family who likes living an understated lifestyle. Measuring 43.75'' H x 72.5'' W x 31.25'' L, it already comes with a foam-filled vinyl changing pad and an assurance guarantee. With its solid wood construction that's built to last, the classically styled Princeton Elite 4-in-1 Convertible Crib and Changer comes in durable, non-toxic finishes of Espresso, Weathered Gray, and White. Your newborn deserves nothing but the best and that includes this beautifully detailed crib and changing table set that has an exquisite curved back and scroll legs to ensure your baby's safety. The classic crib can convert into a toddler's bed, day bed, and into a full-size bed that your soon-to-be-teenager will love. As for an infant, it comes with three drawers for the storage of its nappies, blankets, and clothes. The storage shelves that are the back of the drawers ensure important care products for the baby are within reach like wipes, toys, hair brushes, and baby lotions. It's a sturdy, well-made product and certainly worth considering. Its overall dimensions are 44'' H x 35'' W x 72'' L.
Shiloh, a 2-in-1 convertible, is a stylish, modern-styled bed. As it is a space-efficient, full-sized baby crib that works extremely well even in small nurseries, it became an instant hit with parents. It boasts of well over 400 positive consumer reviews as it meets all the safety standards that are set forth by ASTM and CSPC, giving you the assurance that your little tot will be safe whenever it is resting on its new convertible. With a high-quality look that can be credited to its solid wood construction, the crib extends an exceptional workmanship with notable features including easy conversion into a toddler's bed from a crib. Just like all thoughtfully designed cribs that we've featured on our list, it provides lots of space for storing baby essentials including under-crib storage. Measuring 41'' H x 72'' W x 30'' L, it certainly offers good value for your money. 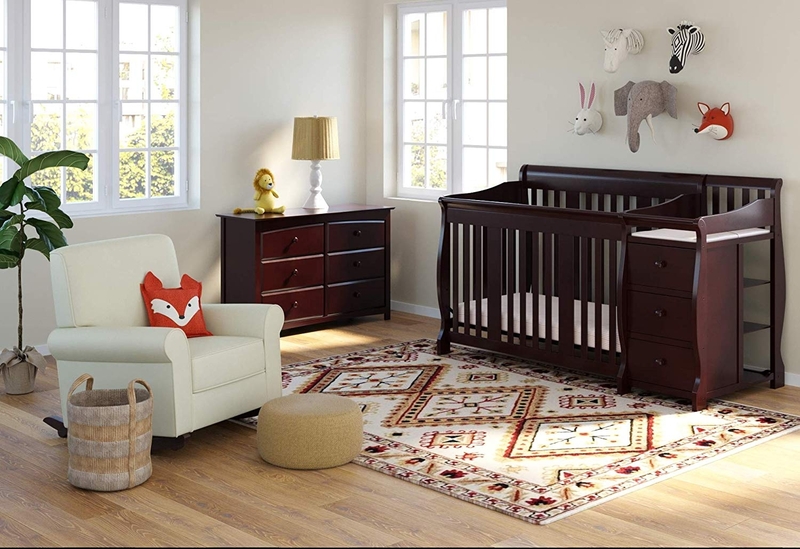 With the Brody 5-in-1 Convertible Crib and Changer Combo, you don't have to sacrifice high-quality solid wood furniture just for a lack of space as it's a 5-in-1 convertible. It will last from your baby's early stages up until it needs to go to college. It's true that almost all convertible cribs offer the same advantage, but this one's a bit unique. Why? It comes with features that are all that you need in ensuring your baby's safety including a safety band for the changing table, a non-drop lateral railing system, and four crib height options. Also, you won't have to scramble about getting the right apparatuses for the crib's assembly as everything will be provided to you. The drawers and shelving beneath the changer will also give you more than enough space in storing your baby's diapers and other necessities. It measures 39.1'' H x 69'' W x 33.2'' L, and you'll have six beautiful finishes to choose from to ensure your baby's crib matches its nursery's décor. This is a popular crib option for those who are on the search for an excellent solution for limited space. As its name suggests, it is a mini crib which is great as it can be placed in virtually any corner of your home. What's great about this model is it is still convertible even when it's a mini crib. When the need arises, you can easily convert it into a twin size bed, which your toddler can use for a long time. If you're wondering how a mini crib can be converted into a large bed, it's because of the changing table which is completely removable! As soon as the changer is removed, there's ample space for a twin bed. The Caso 3-in-1 Convertible Mini Crib also comes with a three-drawer dresser and two shelves for storage. So, if you want a space-saving, convenient convertible with a built-in storage, then this is a great option for you. It measures 41'' H x 56.75'' W x 29'' L when assembled. The Chloe 3-in-1 Convertible Crib and Changer Combo has a sturdy frame made of solid wood that sits relatively low on the ground. Its rugged good looks and quality non-toxic finish give you the assurance your child will love its sleeping area even when it's converted into a toddler's bed. The changing table it comes with can be detached and used as a dresser, which makes this model incredibly versatile. It has the wonderful ability to adapt to almost any nursery design. The dresser comes with a changer at the top and two open shelves underneath for holding everything your baby needs. It's worth mentioning its low price even when it's made of solid wood. It's definitely an economical option, especially when it's a full-size crib, measuring 43'' H x 71'' W x 33'' L, that can be converted into a full-size bed when the crib is outgrown by the baby. Give the Kimberly 3-in-1 Convertible Crib a shot if you're on the market for an incredible, long-lasting, high-end crib combo. It's a luxurious crib and changer set and it has high-end features to justify its price. Its most notable feature is its solid pine wood construction with an unmatched quality. Being an excellent family investment, users say the price is just right, especially from the fact that it's a solid wood converter. It's also easy to assemble and it feels sturdy regardless of how hard you rock it. The crib comes with four adjustable levels and its finish is phthalate and lead-free. The package that contains the 41.5'' H x 70.5'' W x 34'' L crib already comes with a toddler guard rail unlike most crib changer combos sold on the market. Quality, storage, and beauty are the three features that parents look for when they're selecting baby furniture. All these and more are what the Bayside Baby Extendable Crib and Changer Combo has to offer. Even though its price may be off-putting, it's a crib that is designed to be used all throughout the life of your child. It is a solid, worthwhile investment with its premium wood construction. Measuring 45.23'' H x 75.59'' W x 43.07'' L, it comes with all the storage space that you need for the storage of your baby’s essentials. Yes, even its toys! This crib and changer set is worth considering as it brings functionality and beauty to your home. Raising a baby can take a toll on anyone's finances, so you would want to make the most bang for your every buck. To get the best value, check the piece that you are eyeing more closely. Does it have quality construction? Is it of high quality and does it have a solid structure that will last far longer than your baby's jumping phase? If you answered yes, then you've found a bed that's worth investing into. As you're buying online, make sure the product you get comes with an assurance guarantee. To save yourself the trouble of having to return a poorly made piece, check what other parents say about the unit you're getting. Parents are honest, so you can trust their opinion when it comes to the safety of products. If you will be doing the assembly of a crib on your own, then you better make sure that it's quick and easy to put together. It's especially important if you're not handy with tools. Even if you've chosen a pretty piece, you won't be too happy about it if you can't use it immediately as it's complicated to set up.